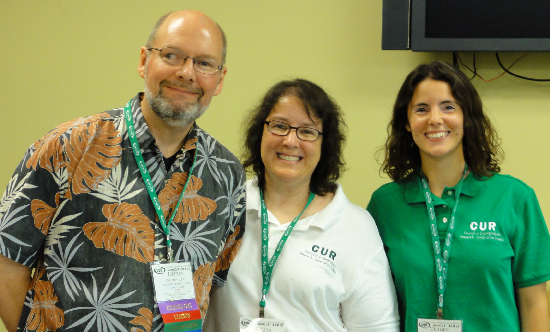 Thanks to Dr. Jeff Ryan (left) and Dr. Laura Guertin (center) for putting together a fantastic GeoCUR session. To celebrate the upcoming 25th anniversary of the CUR Geosciences Division, our session today started with a lively discussion of what undergraduate research was like 25 years ago. It seems that Princeton had a robust undergraduate research program, but at many other institutions, undergraduate research was either focused on mapping or completely nonexistent. The rock hammers, compasses, and field books from 25 years ago are still essential today, but there is no doubt that undergraduate research has come a long way. Today, undergraduate research involves students operating high-level research instruments (like the microprobe) from a remote location. Field books are digital and traditionally lab-based analytical techniques (like the XRF) are used in the field. More undergraduate students are traveling internationally for research, and many more are getting research experience from the moment they begin their college careers. It is truly an exciting time to be conducting research with undergraduates, but when asked about the future direction for undergraduate geoscience research, the participants raised two significant concerns: the need to reach out to underrepresented groups and the need to stay relevant in a changing society. Clearly, there is much work to be done. 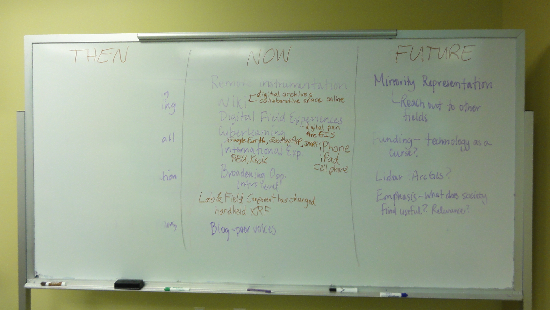 The results of our interactive session on how undergraduate research in the geosciences has changed. (Notice how we mostly erased the "Then" column, for effect of course!). See the GeoCUR blog (http://www.tinyurl.com/geocur) for slides and links from the session.